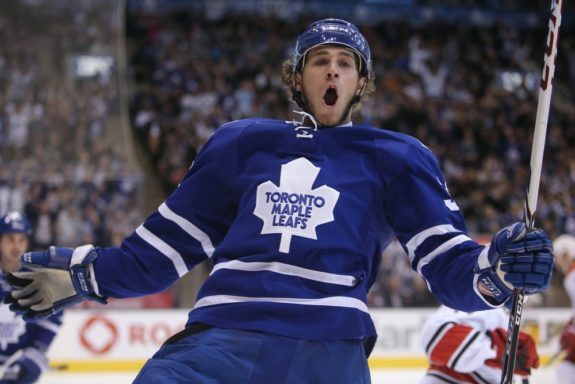 Maple Leafs Forwards: Who Makes the Cut? Heading into the 2017-18 season, the Toronto Maple Leafs are in an admirable, yet difficult, position. Following a tremendous season in 2016-17, which saw many of Toronto’s brightest prospects take a giant leap for Leafs Nation, management will have their hands full when it comes to cutting down their forwards corps to 14 for their roster, and a further 12 for the starting lineup. Aside from the core group of top-nine forwards, the Leafs will have approximately 11 players battling for a spot in the starting lineup, specifically the fourth line that remains available. As it stands, Toronto has a group of under 24-year-old forwards who need significant ice time in order to allow their game to mature and continue along a positive learning curve. With limited NHL spots available, their AHL affiliate, Toronto Marlies, appear to be stocked quite well for this coming season. In fact, Marlies head coach, Sheldon Keefe, may have a tough time trying to give everyone beneficial minutes. In all likelihood, he will be in a position to roll all four lines with confidence each night, allowing candidates to step up among a herd of competitors. Without any doubt, this is a wonderful problem to have. 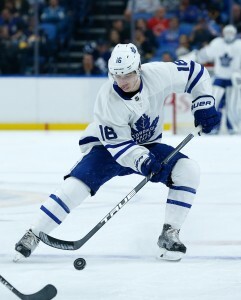 Finally, the Leafs find themselves overloaded with prime assets, ready to boast a deep forward group for this season, with a number of potential NHLers in the system as well. With the noteworthy amount of trade value sitting in the AHL, Toronto is also set up well to make a stab at upgrading their NHL lineup now, instead of waiting two or three years for reinforcements. There’s no denying it any longer, the Leafs possess one of the NHL’s top offensive groups. After finishing the 2016-17 season fifth in goals per game and second in power play success rate, the numbers will only get better from here. Leading the Leafs group of core forwards are their three young superstars, all of whom made a serious case for the Calder Trophy last year, as the league’s top rookie. These three represent the future of the Toronto Maple Leafs, with any future success coming on their shoulders. After that comes the team’s veteran forwards, including newcomer, Patrick Marleau. These are the longstanding Leafs who have suffered through painful years of failure and long off seasons, as grateful as anyone to finally feel success in hockey’s hotbed. Next comes another couple of strong youngsters who have guaranteed a spot on the opening night lineup as a result of their play from last season. They represent a crucial and valuable component of the team’s success, night in, night out. With these 10 players seen as locks to be in the lineup each night, that leaves just two spots open for a long list of players who all have very legitimate reasons to be in an NHL lineup, one way or another. Alongside the aforementioned 10 forwards are a few veteran players who feel like they rightfully deserve a spot in the lineup for a number of reasons which are headlined by their respective contracts, not to mention very respectable and lengthy NHL careers. Now begins a long list of 24-year-old and younger players who have gone through the rings of minor hockey, only to be rewarded with a few, short opportunities to show their value at the NHL level. None of them have been able to find a permanent position, but each of them feel they warrant a genuine chance to earn that elusive job. There you have it. A list of 11 forwards who can all make a very intriguing case for themselves to earn one of just two spots in the Leafs lineup. While there are an additional two spots to be included on the team’s roster, no one wants to sit in the press box each night while their game and potential stagnates. The Leafs will likely keep four of these forwards around, but only two will have space to play regularly. With that considered, Martin and Moore are virtual certainties to make the Leafs roster, in the very least, with both players on one-way contracts. Moore is the early favourite to play fourth-line centre at this time. Meanwhile, Martin played all 82 games last year, making his absence unlikely. Another player in a similar situation is Fehr, who played in just one game for the Leafs after arriving in the Frank Corrado trade. While Toronto may elect to keep him on their roster, they could also send him through waivers with hopes of having him on the Marlies. Ben Smith, on a two-way contract, looks destined to be sent down to the AHL given the competition around him for a centre spot. Among the young guns looking for a spot, Leivo and Kapanen seem to be the most deserving of an NHL spot. Leivo was protected over Brendan Leipsic in the Expansion Draft, and played very well in his 13 appearances last season. Kapanen is coming off a breakthrough year in the AHL, and while additional seasoning wouldn’t hurt, he looks ready to make the leap. Soshnikov played in 56 games with the Leafs last year, but was unable to build off of his success from 2015-16. Rychel, in his opinion, has spent enough time in the AHL and has made his desire for an NHL opportunity known, although management may not agree. The long shots would include Aaltonen, Gauthier and Brooks, who are certainly the least NHL-ready of all candidates at this time. With that said, all three have NHL talents and an ability to add value to the Leafs. All in all, the best bets to make the opening night roster would be Moore, Martin, Leivo and Kapanen. Moore and Martin essentially own a spot on the roster, while Leivo and Kapanen are the most deserving of an opportunity given their recent performances. Of course, all of this will heavily depend on training camp results, especially from the latter two. Injuries are also very possible, meaning additional spots could easily open up come Oct. 4. With that said, stay tuned on this topic throughout the offseason.